The Economist -- "In unsurprising but good news, Case-Shiller reported new home price data this week that showed a definitive upward move in markets across the country. From March to April, Case-Shiller's 10- and 20-city indexes rose 0.7%, seasonally adjusted. All but three of the tracked markets saw month-on-month increases. Half of tracked cities notched year-on-year price increases in April. Price rises have looked imminent for some time. Sales figures have been trending upward and inventory numbers are at remarkably low levels. Rents have also been increasing, making home purchases look ever more attractive. There is still an ample stock of distressed and bank-owned homes to work off, but America seems to have achieved bottoms for both sales and prices. Housing markets have adjusted. This turning point could be a source of considerable strength for the American economy. Rising prices should have a direct wealth effect for owners and should sharply limit new defaults and foreclosures. As a result, mortgage lending should begin to look much more attractive. A return to something like normal lending conditions could turn fledgling increases in sales and construction into strong increases, boosting GDP and construction employment." 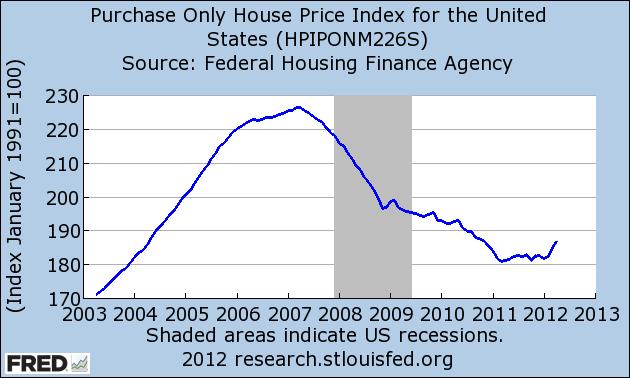 MP: The top chart above shows the monthly FHFA House Price Index (HPI) through April, based on the purchase prices of houses financed with Fannie Mae or Freddie Mac mortgages. The April index was 3% above its year-ago level, and 3.3% above what is apparently the cyclical low point for the HPI in March of last year. The 3% annual gain in the HPI was the largest yearly increase since November 2006, five and-one-half years ago (see bottom chart). This FHFA index of national home prices is more comprehensive geographically than the major metro-area based Case-Shiller index, and includes both small cities and major cities like Houston (not one of the 20 metro areas in Case-Shiller), where median home prices in May reached a new record-high level. The HPI is also available now for the month of April, whereas the most recent Case-Shiller index is a three-month average of February-April. Bottom Line: The evidence continues to mount that we've passed the bottom of the U.S. housing market, as we continue to see strong sales gains for new and existing homes, a two-year high for pending home sales, and gradual increases in home prices. Look for more improvements in the real estate market going forward through the rest of the year. this index is a little tricky in major cities. 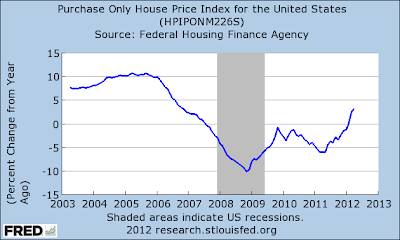 "The HPI is a broad measure of the movement of single-family house prices. The HPI is a weighted, repeat-sales index, meaning that it measures average price changes in repeat sales or refinancings on the same properties. This information is obtained by reviewing repeat mortgage transactions on single-family properties whose mortgages have been purchased or securitized by Fannie Mae or Freddie Mac since January 1975. " first off, it's signle family only, so that rules out most city units right there. second, it's just fred and fan, so it has a price cut off that wipes out most of the rest. finding a single family home in many us cities that falls under F+F limits is no mean feat. you can likely do it in houston, but not in NYC, SF, chicago, etc. i'm not sure this index is so much broader than CS. it will miss much of the low and high end. housing in general seems to move roughly with cpi. i think "no real gains" is pretty normal in most markets. despite some wiggles and bumps, housing was pretty much right where it was in 1970 in 1998 in real terms. it's just this last boom/bubble that was aberrant. the takeaway i found really interesting in that chart was the 70's. people speak of owning a home in the 70's as the golden era of appreciation, but prices were down from 1970 in real terms for pretty much the whole decade of disco. just goes to show you how little people actually know about how they are doing financially. most americans lose money on their homes over the the whole course of owning them and think they made a profit. Yep, the only positive period in the 70s was roughly '76-80, the period of (amongst other *special* things like disco) the huge gold spike. And a huge *amen* on how little the huge majority know about how well they're *not* doing, thereby my huge concentration on inflation and its horrifically pernicious effects. Even the BLS asserts that the CPI actually measures inflation, while admitting it's not a cost of living index. Orwell is pleased. 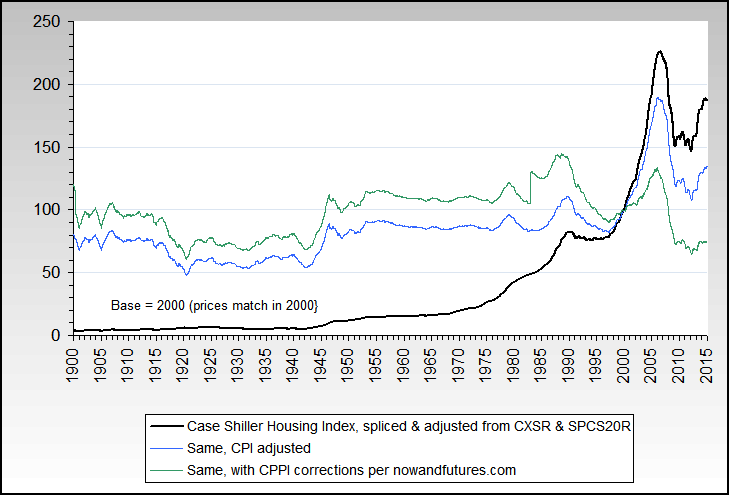 Forgot to add - the "best" part of that chart shows that housing is still dropping (even with just a CPI-U correction), with more to come. Add a *grin* to my disco comment too.